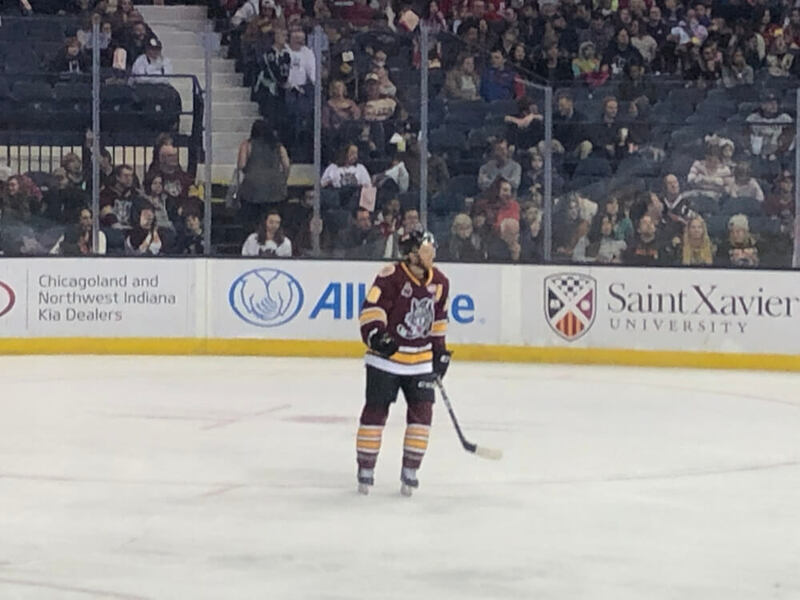 The Chicago Wolves hockey team pulled away with a pair of goals in the third period, topping the Manitoba Moose 5-2 on Saturday night before 11,108 at Allstate Arena. Forwards Tomas Hyka, Daniel Carr, Keegan Kolesar and Gage Quinney and defenseman Zach Whitecloud all scored for Chicago (25-15-5-1) while goaltender Oscar Dansk (15-7-3) saved 24 of 26 shots in the win. Marko Dano and JC Lipon each scored for Manitoba (20-20-3-2) and netminder Eric Comrie (16-12-4) ended the night with 24 saves. Hyka finally broke through at the 16:26 mark, skating past four Manitoba players before shooting the puck between Comrie’s legs to give the Wolves a 1-0 lead. Wolves Hockey player #18 TJ Tynan from Orland Park on the ice at the Allstate Arena. Photo courtesy of Ray Hanania. Dano tied the game up at 18:14 when he was in the right spot to catch a bounce off the end boards and slip it past Dansk’s pad. The Wolves went into the intermission with a 2-1 lead thanks to Carr, who scored his 23rd of the season at the 19:02 mark. Linemate Brooks Macek centered the puck to forward Gage Quinney, who was with Carr in front of the net. Both Wolves batted away before Carr deposited the puck behind Comrie. Manitoba tied the game once again with a short-handed tally 5:23 into the second period on another bounce off the end boards, but the Wolves took the lead back less than three minutes later with Kolesar’s goal. Kolesar was just above the goal line on the left side of the ice when he sent a shot off the crossbar and into the net at 7:53. Whitecloud added to the lead early in the third, collecting a drop pass from forward Brooks Macek and rifling it over Comrie’s glove at 3:34. Manitoba fought hard to even things up, but Quinney scored at the 15:01 mark to put the game out of reach. The Wolves hit the road for four games before returning to Allstate Arena on Sunday, Feb. 17, against the Iowa Wild. To get the best ticket deals, visit ChicagoWolves.com or call 1-800-THE-WOLVES. THIS POST HAS BEEN READ 13031 TIMES SO FAR. THANK YOU!